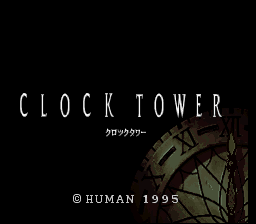 Clock Tower is a Super Famicom, Point ’n Click Horror adventure game (this means pointer controls, investigating your environment and puzzle solving). You play as Jennifer Simpson, an orphan who has been adopted by the owner of a secluded mansion, along with three other girls. Upon your arrival to the mansion, all other girls suddenly disappear and you’re left there alone in the mansion’s foyer. It’s up to Jennifer to find out what’s going on and avoid being killed by the slasher Scissorman. Though be warned, your health is determined by Jennifer’s stamina. The more you run, the faster your stamina depletes and the harder it becomes to escape Scissorman. Therefore, rest often and don’t run anymore then you need to. The above is coupled with 9 different endings, determined by who you save and what you discover.